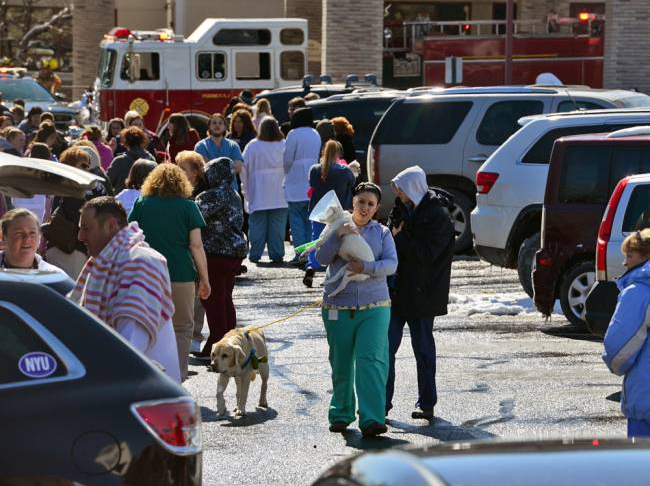 PARAMUS, NJ– An MRI machine exploded at Oradell Animal Hospital on the morning of Friday, March 6th. Three electricians were injured, one critically. None of the 60 animals or 100 employees were hurt. Workers at Oradell Animal Hospital evacuate the building with the animals after an MRI machine explodes on Friday, March 6th. The worker who was critically injured was taken to Hackensack University Medical Center. The worker suffered cuts and crushing-related injuries while two other workers were treated for minor to moderate complications at Hackensack University Medical Center and Valley Hospital. The identities of the workers are being withheld until family approval, but none of them worked for the hospital and were contracted from a private company. The explosion was caused by a helium leak. The section of the hospital where the explosion occurred has been ventilated and made safe. Tony Palminteri, owner of Oradell Animal Hospital, said that dogs, cats, and one bird were removed from the hospital and several of the critical care animals were transferred to surrounding animal hospitals. Owners were at first worried about the safety of their pets, but were relieved when they were informed that no animal was harmed. The building will remain closed until further notice.